That's right, fish like cichlids are the engineers of the aquatic world. You will see them busy on the bottom of your aquarium moving rock or swishing their tails to fan sand. They do this to create beds that they can hover over and defend like a soldier in a foxhole. When your little friends sleep, often times they will do so over a bed they have dug out in the substrate. Your choice for the bottom of your tank can be very important. Substrate not only gives your fish an area to call their own, it also provides important surface area for those helpful bacteria mentioned on the Nitrogen Cycle page to do their work. An aquarium without substrate will have many billion fewer bacteria living in it and can degrade water quality. So What Are My Substrate Choices? There are basically three types of substrate that you should be thinking about as a novice aquarist. Each type has an advantage. The choice of color can also matter. Gravel This is probably the most common substrate that you will see in freshwater aquariums. It is good for anchoring aquatic plants and providing you a wide variety of color choices. If you choose gravel, fine gravel is the best choice. Pea size or smaller will allow your little wet buddies to have substrate that is small enough for them to make their beds in. 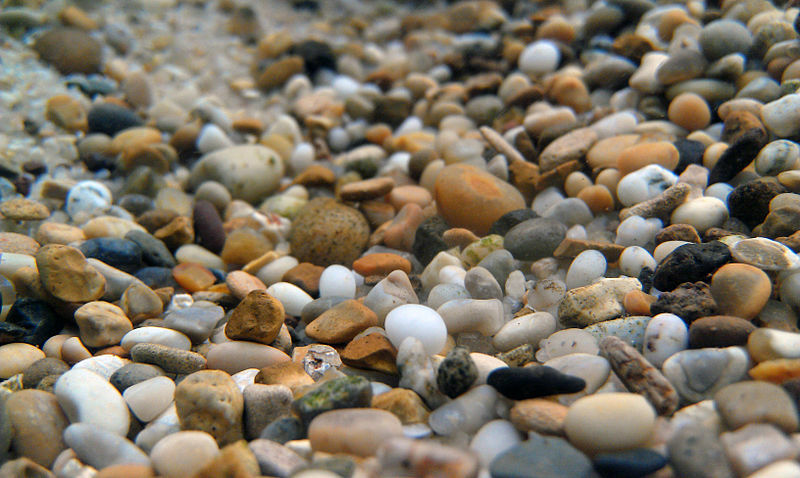 When selecting gravel, be sure to find gravel that is rounded and of roughly uniform size. Substrate with sharp edges can harm your friends. Darker color choices seem to make the coloration of your little buddies stand out better. Sand This type of substrate is closer to your friends real world habitat. Most tropical fish that you place in your aquarium come from sandy bottom rivers and lakes. Sand is much easier for your friends to make beds in and it can be very interesting to watch them fan thier tails in the construction process. You cannot use sand if you opt to have an under gravel filter because it is to fine and will clog up that type of filtration system. If you choose sand substrate, you can eiter use sand from a pet store or use "play sand" that has been sterilized. Color choices for this substrate are limited. Marbles A substrate of marbles can be an interesting choice. Small marble substrates are a good choice for an aquarium used for breeding fish. The size and shape of the marbles allow the fish eggs to be trapped deep in the substrate where feeding fish cannot reach them. The downside to this choice is debris and other things that you usually want to clean out of your aquarium also become trapped there. This type of substrate requires more frequent cleaning, but the color choices are stunning. Choosing the type of substrate you use should outweigh the color choice. Also, color choice can matter to some types of tropical fish. Some prefer darker substrate and some prefer it to be lighter. Research your choice of tropical fish and find out what they like. A nice looking aquarium is much more interesting when your little wet friends are happy. The substrate in your tropical fish aquarium should be one to three inches thick. Aquariums with live plants will need thicker substrate for anchoring purposes. Here is a simple formula for the amount of substrate you will want to buy. If you end up with extra substrate, that is ok. You may need it later if you add plants or want to do some underwater construction. I like to keep an extra bag on hand just so I have it if I need it. Most substrate is fairly cheap anyway. Take a look at our affiliate partner's site to browse different colors and types of substrate. For more detailed information, check out Wikipedia's Aquarium Substrate page.